Previously, on MinerBumping... Agent Liek DarZ killed Jaroth Kings, a non-compliant CHODE.-alt miner, and was treated to a number of impertinent remarks. 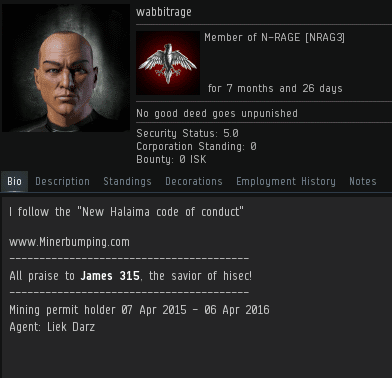 Liek contacted permit-owner wabbitrage, the CHODE.-alt CEO of Jaroth's corp. So transparent. Jameyu is doing practically anything for content. Even lies. 1. “The Killjoy” – Basically, your corps will do nothing. Your members will dock up in stations and stay docked as long as wartargets are online or in/near your systems, and even just log off and come back on later. No one will actually engage the hostiles for any reason, denying them any PvP whatsoever. a. 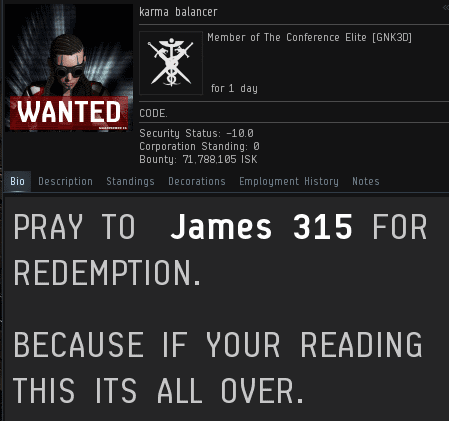 Staying docked will immediately lower the morale of the enemy corps. Denying them any action or potential for kills the fun/vengeance/merc payment factors of the wardec. In essence, you are utterly wasting their time. If you want to play this up real nasty, have all of your people dock up and stay online. This will force the aggressors to camp that station or surrounding gates in the hope they might snag a kill. NEVER undock or tell the enemy if you are following this strategy, it makes it ever more effective. b. After a few days of being denied kills/action all together, the enemy corps may cancel the wardec or simply not renew the dec after the week is over. Cool story bro. Everyone in CODE, GSF and every other independent agent out there is an alt of The Mittani. Didn't you know? He's just that good. This is getting exciting. I'm gonna make some popcorn, anyone want some? "Because if you're reading this, it's all over." Please note the correct use of the word "you're" vs "your". Another epic tale in the works. Well done, Saviour! That feeling when I read karma saying, "nah im over this guy"
where's butthurt miner at these days? I thought he was committed to trolling this site. He can't even commit to that properly. Miners have the attention span of a pigeon. Why do you think they are always afk?